Anyway a comment came for approval today and so I logged back in and thought I’d do a post showing you some of things I’ve worked on in the interim. I hope you like them. Sew blocks 4, 5, 6 and 7 together as shown below. 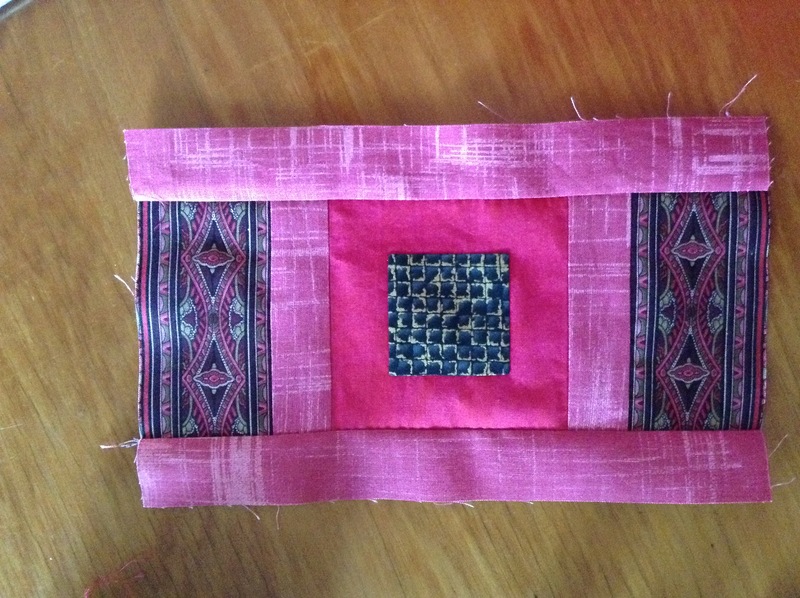 Now, because we sewed four blocks together before we QAYGed, we need to sew four blocks together for the backing to maintain the patchwork look. Optional though. If you want to just use one piece of fabric for the back that’s fine too. 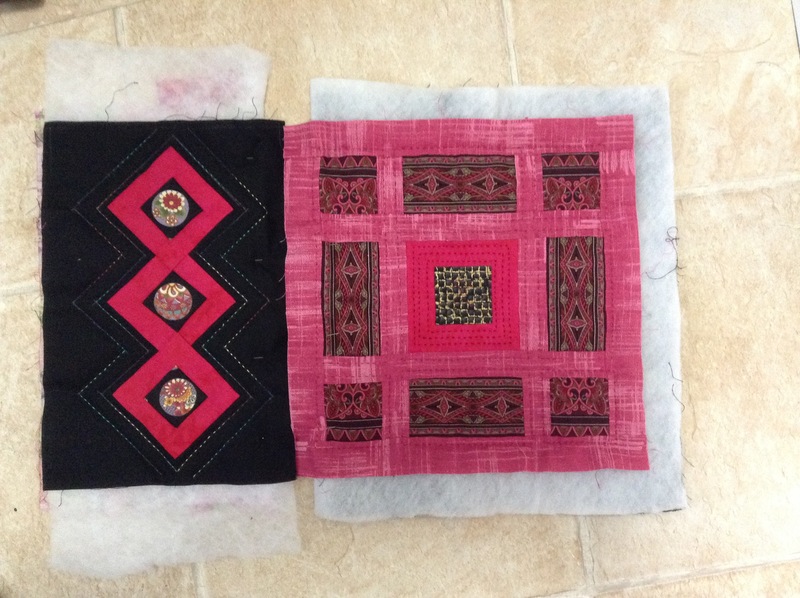 Then I sandwiched the joined blocks and backing with some batting and hand quilted the blocks. Then I joined this section to section one using the technique shown in the earlier posts. Here’s the bottom half of the quilt finished. What do you think? I made this block using appliqué. If you would prefer to make it using foundation piecing, feel free. I’ll show you how to draw it up and then how I made it. 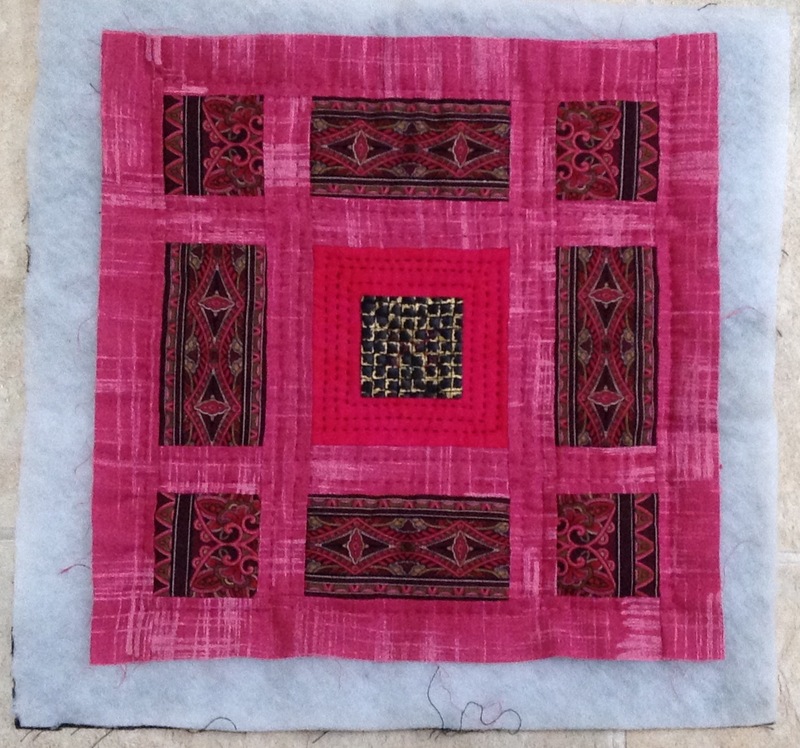 The block measures 28.5″ X 4.5″. I printed a few sheets of the 1/2″ graph paper I gave the link for in Block 6 and taped them together. Then I drew the pattern as below. I drew a rectangle 28″ x 4″ (no seam allowance on the pattern, I added that later) I marked every inch with a dotted line to make it easier to work. Then I drew a line from the bottom corner to the 2″ mark on the top level and from there down to the 4″ mark on the bottom, and so on till I got to the other end. Then I went back to the beginning at the left and drew a line from 1″ up from the bottom left corner to 1″ down from the 2″ mark and so on all the way across. I shaded in the areas as shown. Then I transferred the unshaded shapes from the drawing onto freezer paper. Then I cut around these shapes using the fabric that would look like the background, making sure to leave at least 1/2″ at the bottom edge to accommodate the seam allowance and wiggle room. I then put the shape, shiny side up, onto the wrong side of the fabric and ironed the edges over as shown. I then placed the shape in position onto the fabric, ironed it to stick down and appliquéd it down and repeated along the row. I left the edges until last. 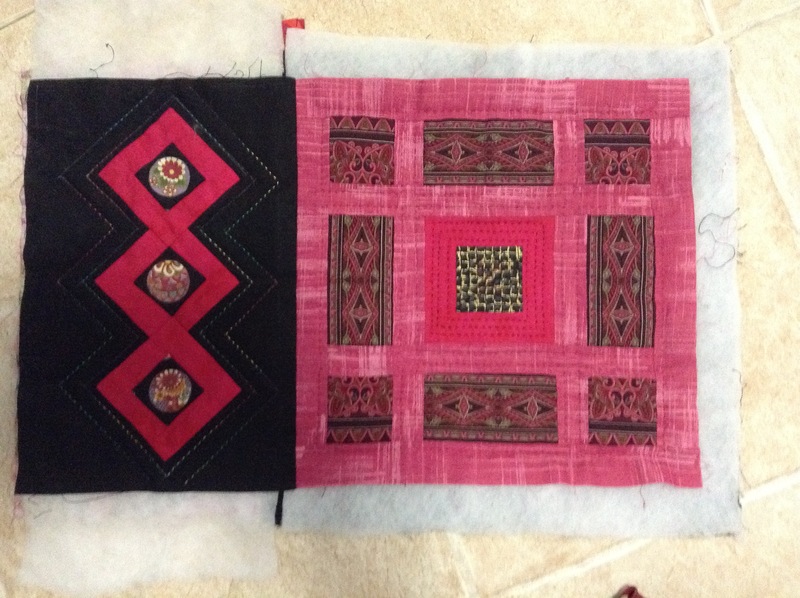 Note that the bottom edges are not sewn and they get straightnened up when the block is completed. 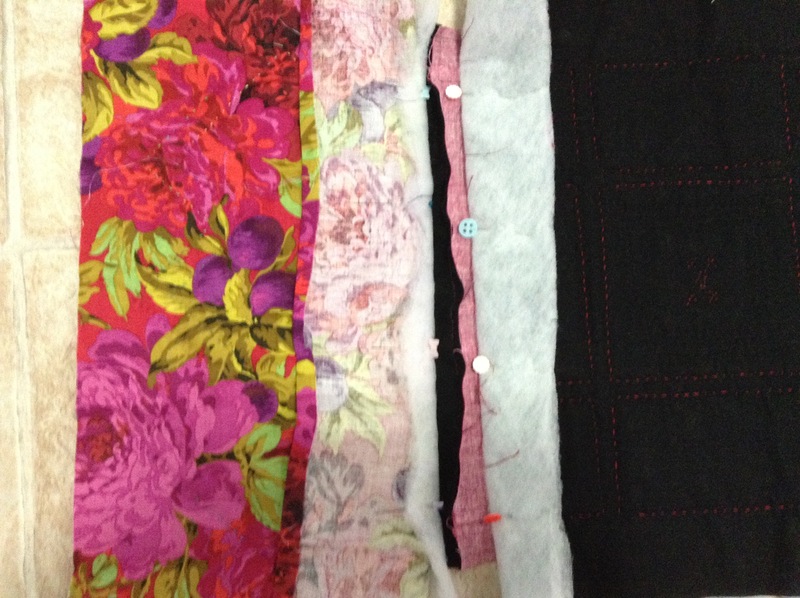 When you have done them all you can slide the freezer paper out from the unsewn edge, press and square up the block. Part 2 is mainly appliqué. Here’s where we finished up last time. Now we are going to appliqué some strips down the centre of the middle blue strips. You will need four pieces of fabric 6.5″ X 1.25″. Take each strip and press it in half. Then open it out. Then press one edge into the centre. And then repeat with other edge. When you have done that for all four strips, get your block and mark (I used pencil) the centre line. Then line up the fold in your strip with that line and pin it to the block. As you can see you don’t want it to go all the way into the centre and you can let it hang over the edge of the block. 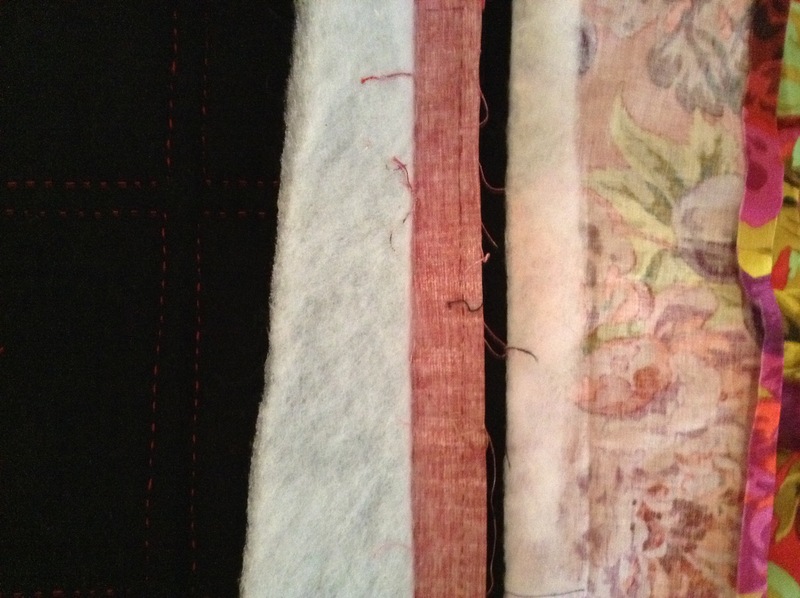 Then appliqué the strip and repeat with the others. Now we are going to make the diamonds for corners. To make your template, draw a square 4″ X 4″ and mark 1″ from each corner like so. Then draw lines from the top left corner to the 1″ from the left mark on the bottom of the square, from the 1″ from the bottom on the left to the bottom right corner, from the bottom right corner to the 1″ from the right on the top of the square and from the 1″ below the top right corner to the top left corner. See below. Transfer this diamond by tracing onto freezer paper, four times and cut out. 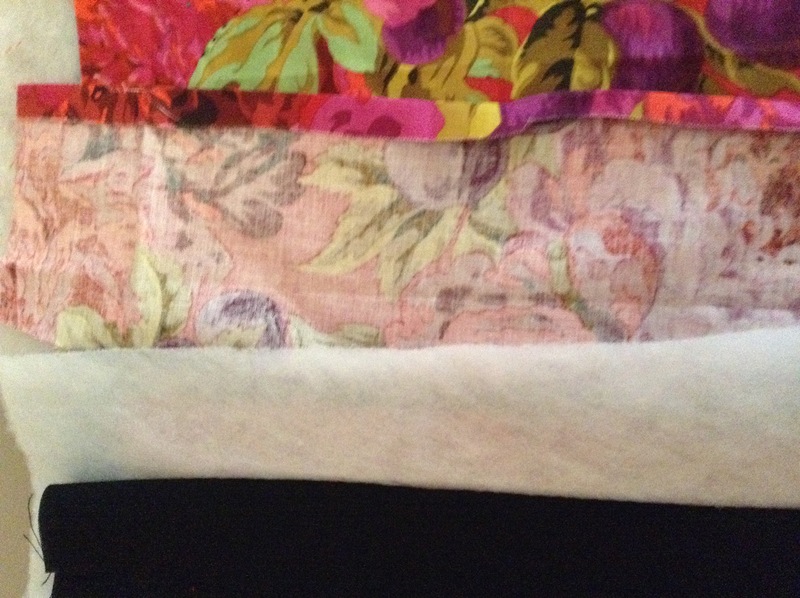 Take your chosen fabric and place the freezer paper on the wrong side of the fabric, shiny side up. Cut around the shape leaving around 1/4″ extra. Take your iron and press the seam allowance onto the freezer paper as we have done in previous blocks. Then position your diamonds, freezer paper side down onto the outer squares and press first from the front to stick them in place and then from the back to secure them. Then appliqué them to the background. Then do the same with the other three diamonds. Cut the background away and remove the freezer paper as we did for previous appliqué and press. Now we’re going to place a series of 5 circles down the vertical line. Four will be half and half, black and pink and one will be quartered. 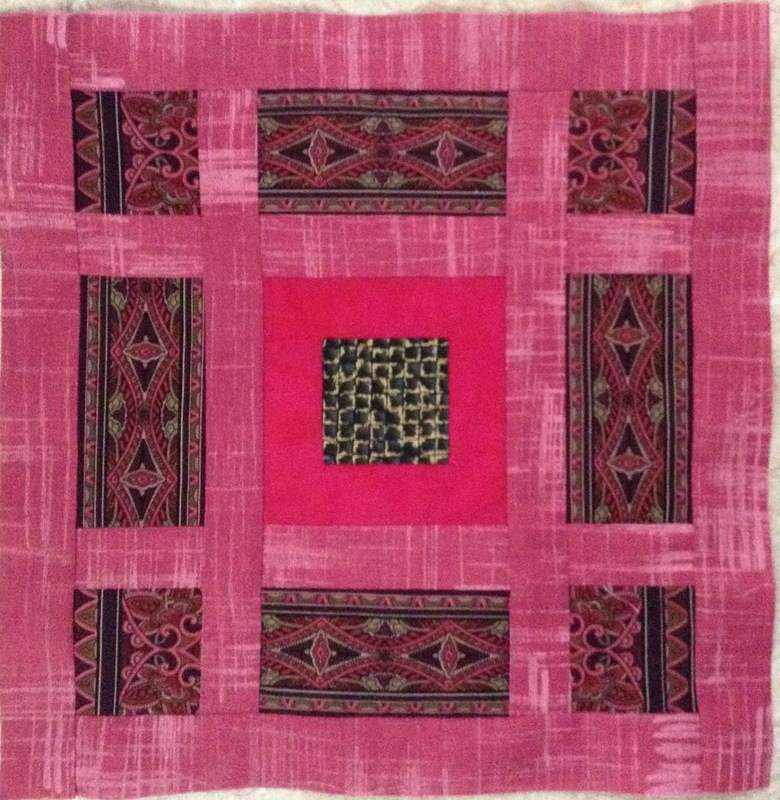 We make the circles by sewing a strip of the black and a strip of the pink together then cutting it into a square of fabric big enough to cover a 1.5″ perfect circle template. Remember the centre of the joined fabric is the stitch mark NOT the edge of the seam. It may seem obvious but it’s an easy mistake to make. Take some thread and sew a running stitch around the circle leaving the thread in the needle when you have completed the circle. 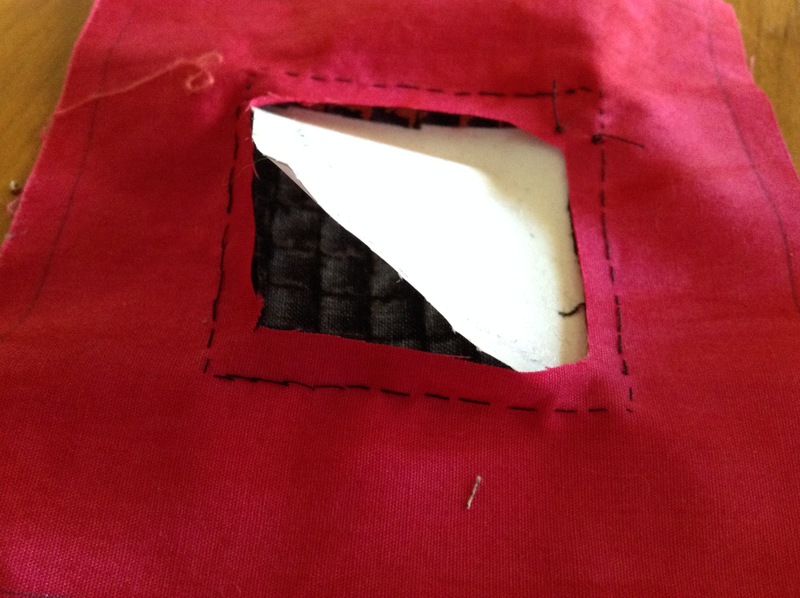 Trim off the square edges then pull the thread tight around the circle. I sewed a couple of cross-circle stitches to hold it tightly in place and finished with a couple of backstitches. This is what your circle should look like front he front. Measure your block so you can position your circles equidistant from one another and pin in place. 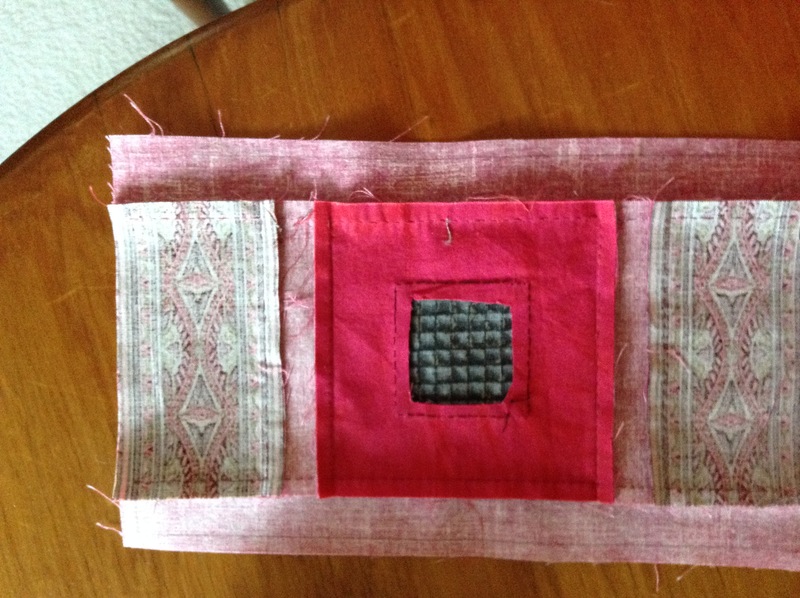 Make sure you place the black fabric half on the side nearest to the pink square edge and vice versa. The appliqué the circles down and cut the background away to remove the Perfect Circle templates. 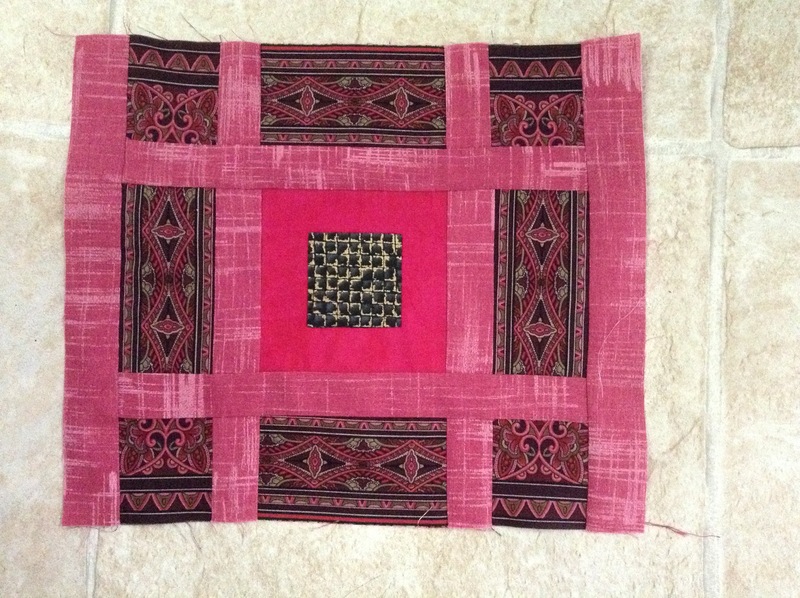 To make the central circle take two pieces of joined fabric and sew them together to form quadrants, then use the technique mentioned above to create the circle and appliqué it in place. The last block was relatively simple, this is a little more involved so I’ve split the instructions over two posts. 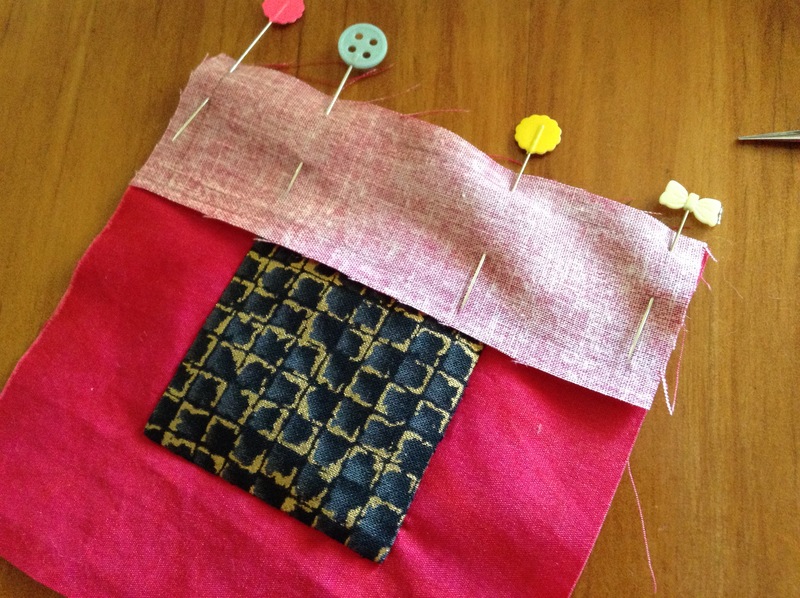 Sew a 2.5″ strip of fabric 2 to one side of the 4.5″ square of fabric 1. 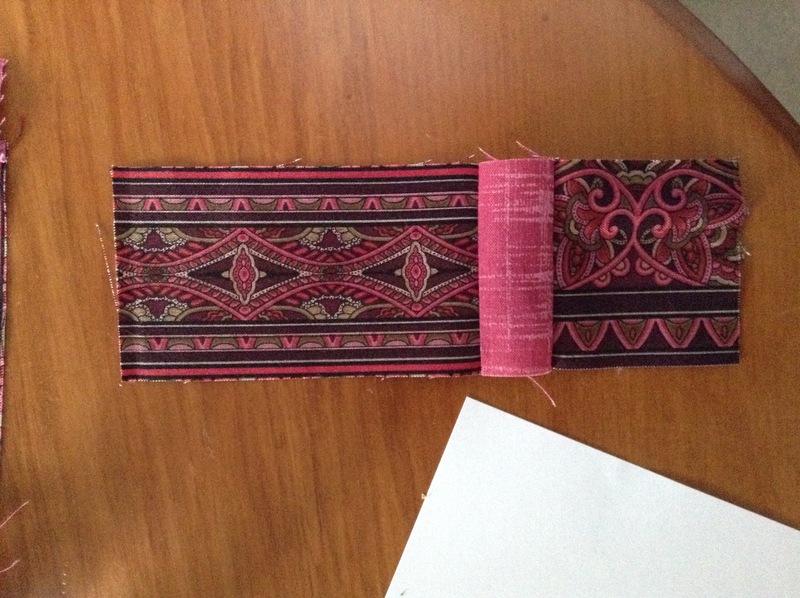 Then sew the 5.5″ strip of fabric 2 to the adjacent side. Repeat this with another blue square and the other black strips, then do the same with the remaining squares and the pink strips. 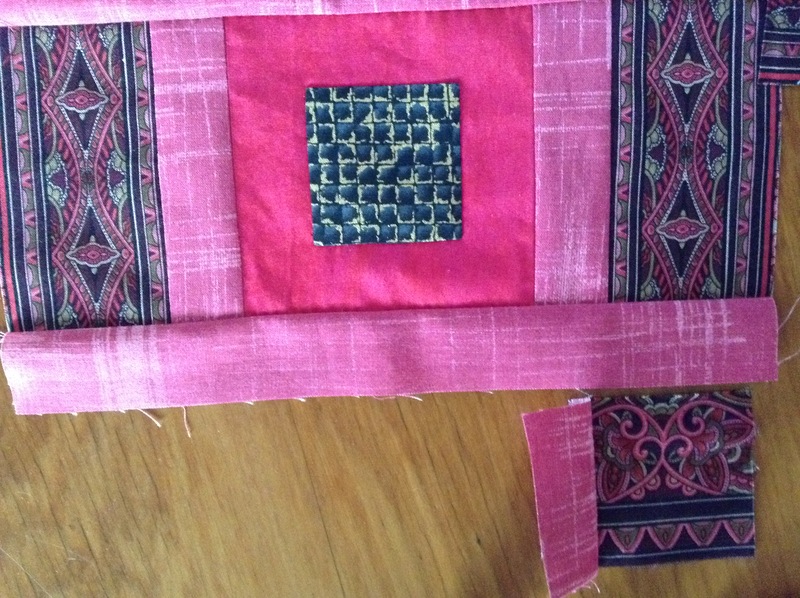 Then take one of the smaller 2.5″ wide blue strips and sew it onto the edge of the square where there is a seam. 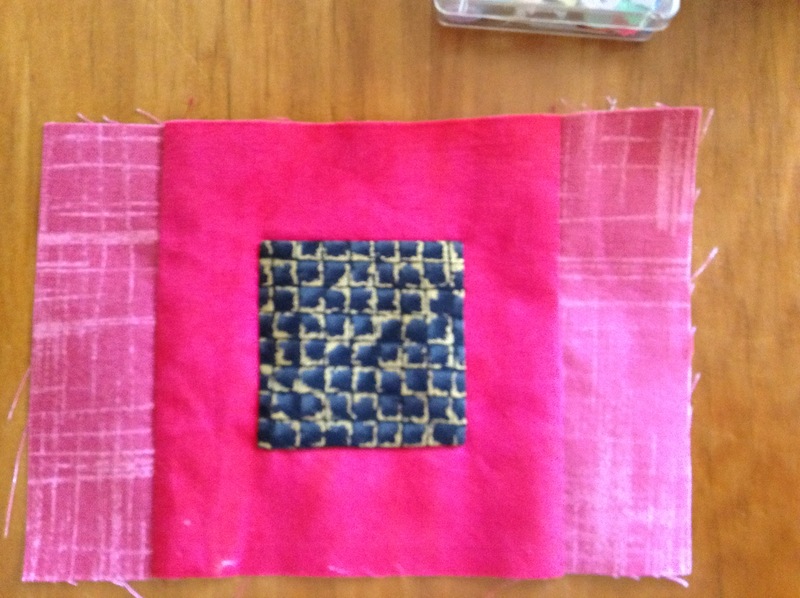 Then sew one of the pink strip squares to the bottom, this time sewing the non-seam side to the blue strip. Repeat for the other two squares and then sew each of the combination strips to the 12.5″ X 2.5″ blue strip. 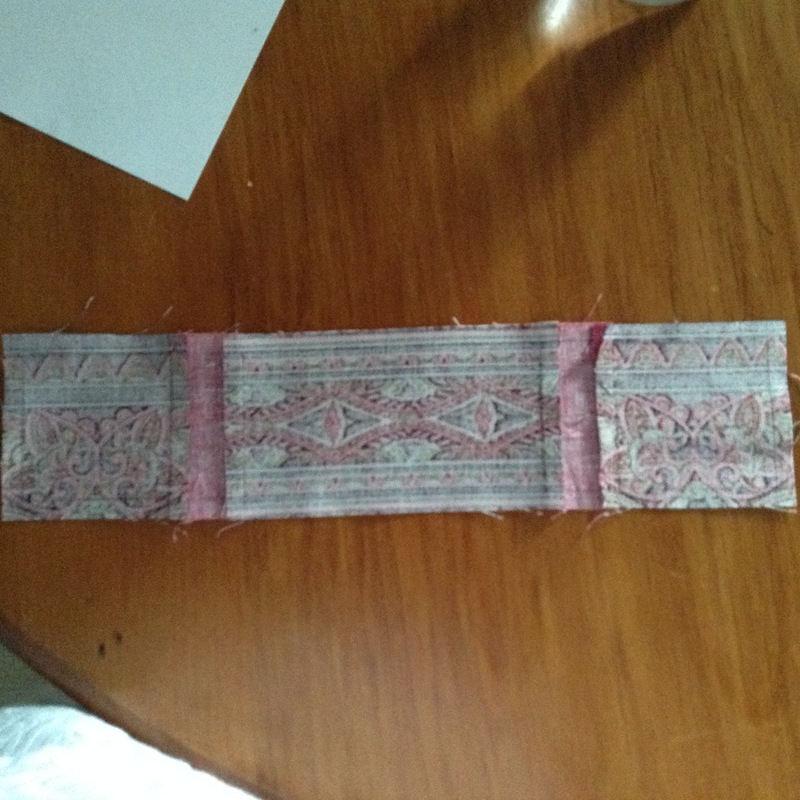 Sew the two thinner strips together then see the wider one on the end. Take three 1″ squares of freezer paper and, using the techniques we’ve used previously, applique the 1.5″ fabric squares onto the wider strip at regular intervals. Then you’re done! Blocks 4, 5, 6 and 7 will be sewn together BEFORE we sandwich and quilt them. It’s still a manageable unit and makes the construction simpler. One 2″ diameter circle (finished size). 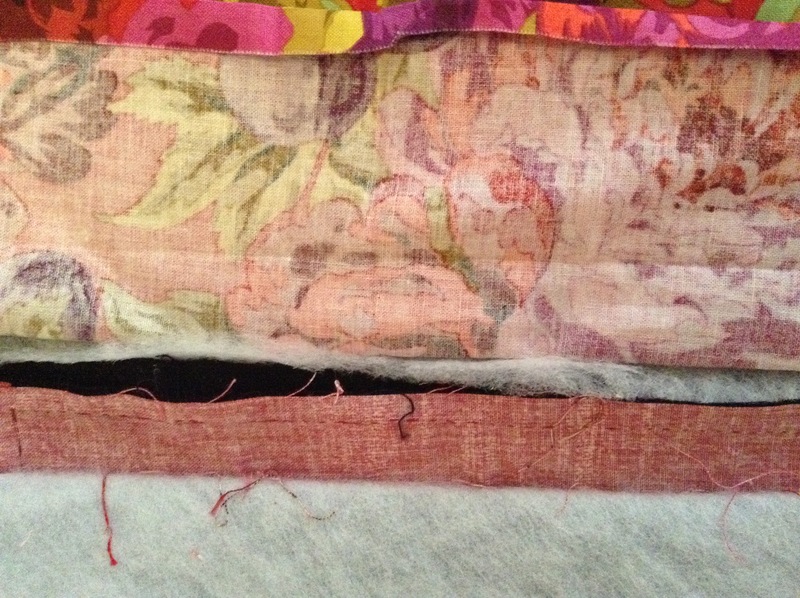 Strips of linear or border fabric. 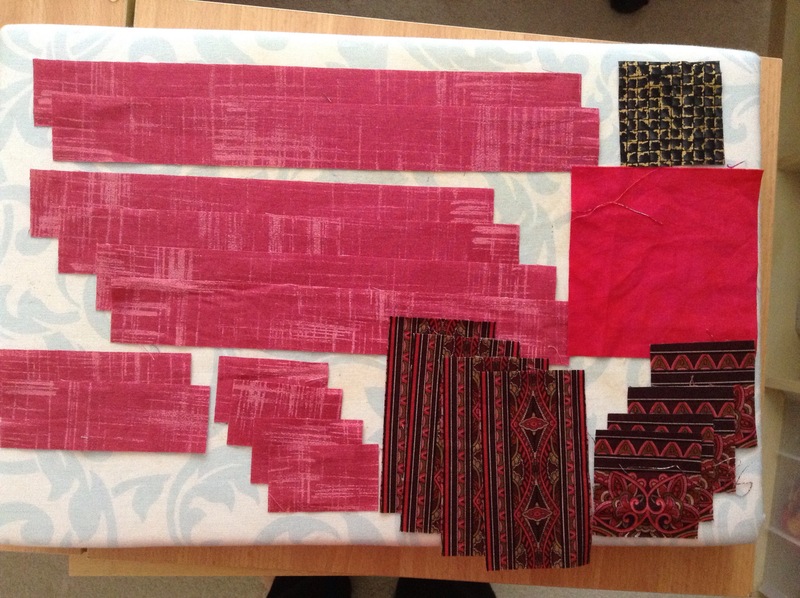 Length will depend on pattern matching. 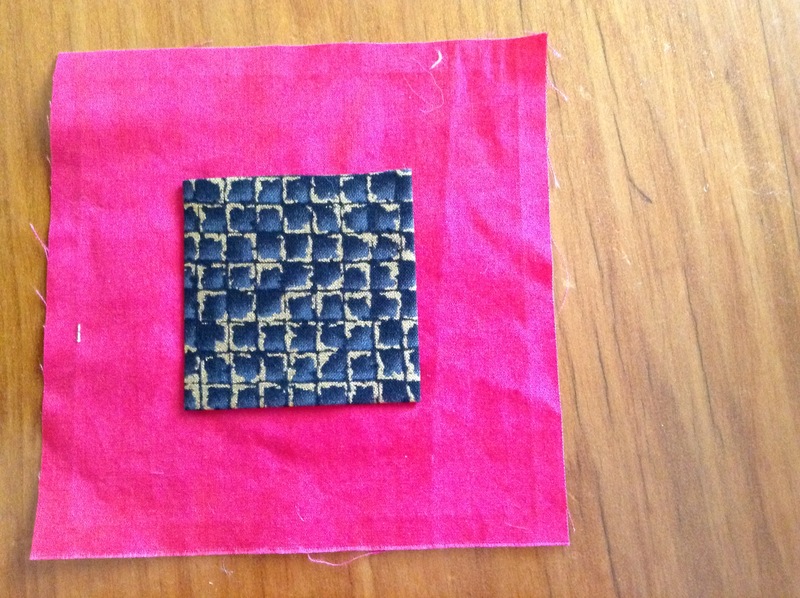 Cut a 3.5″ square of Freezer paper and cover it with the 4″ square of fabric the way we did in Block 2. Then using the same technique, appliqué the square to the centre of the background fabric, cut the excess background fabric off and remove the freezer paper. Then cover a 2″ diameter Perfect Circle with your fabric, attach it to the centre of the central square and appliqué it as we did in Block 1. 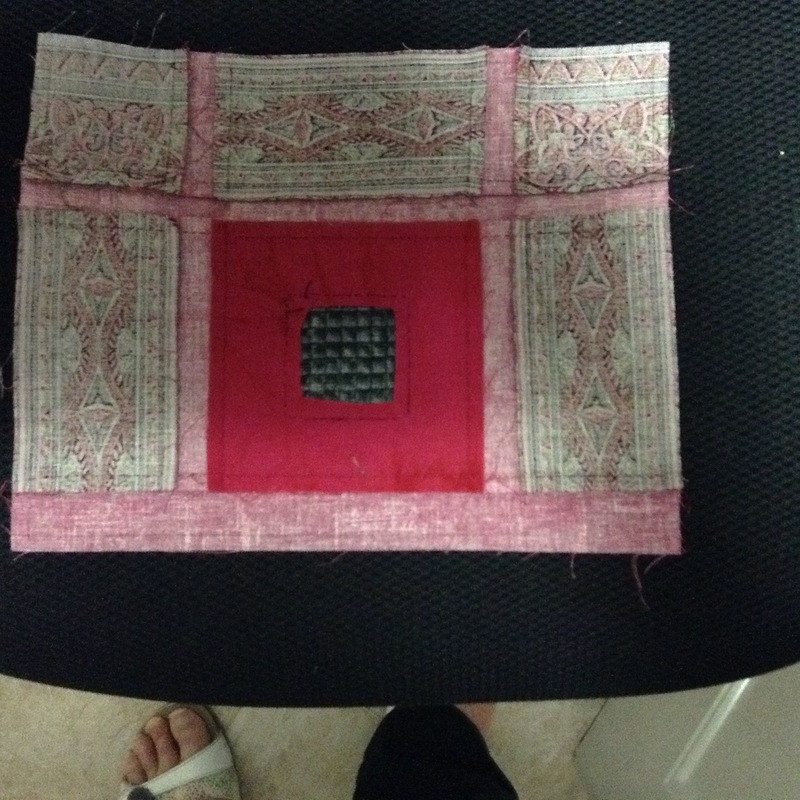 Then remove the excess square fabric from the back and remove the perfect circle. Now cut four 4″ squares out of freezer paper. 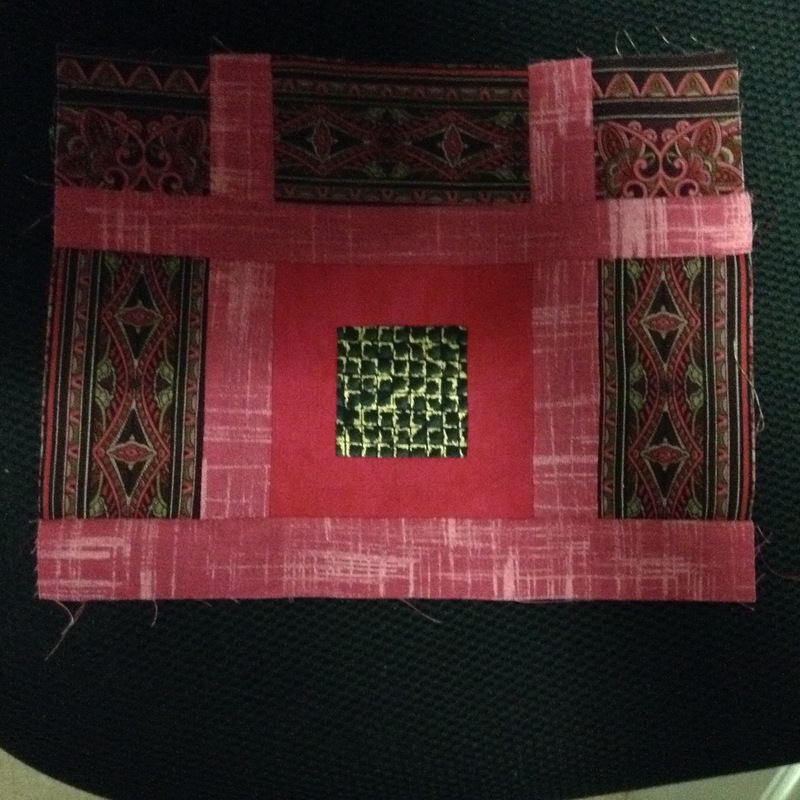 Then cut a 2″ square out of the 4″ in one corner. Do this to all four. Take your 4.5″ squares of fabric and fold over the seam allowance onto the sticky side of the freezer paper and we have done before. 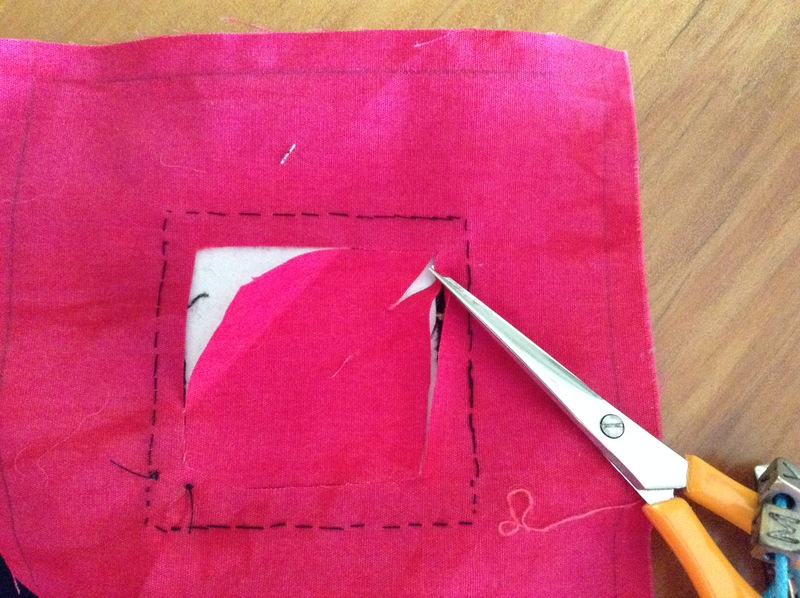 When you get to the centre of the cut-out, put a slit in the fabric to allow it fold over. Place these corner pieces 1.5″ in from the edges of the background one at a time. Iron to the background, appliqué and then remove the freezer paper and repeat with the others. If you’re happy with the relative proportions then cut out the centre piece and use it as a template to cut out 4 freezer paper patterns. The next thing is to join our strips at right angles. I find the best way is to fold the end of one strip at 45degrees. 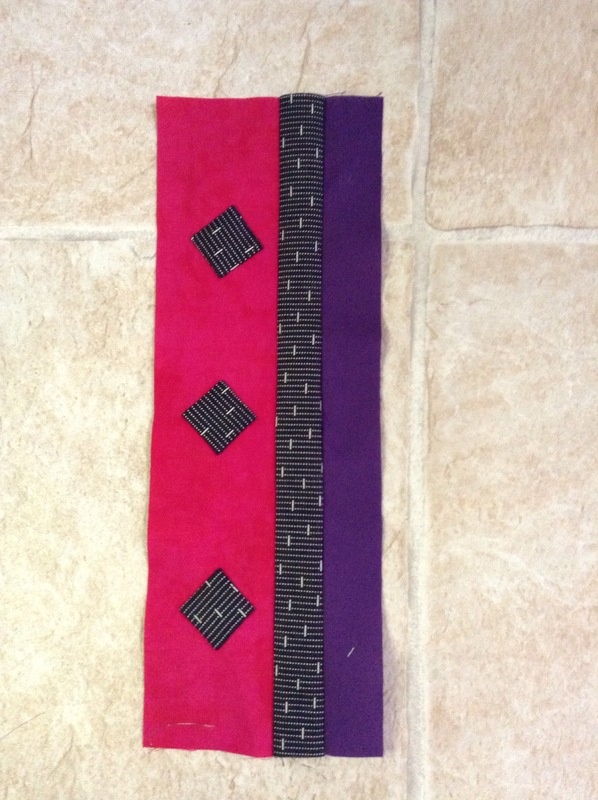 Play around until you know where best to place it to achieve the pattern match and then spread a little Elmer’s Glue on the underneath and position it on top of the other strip, iron the glue set, then open it it out and sew the seam line. Now, take your right angle fabric and iron the seam allowances down onto the freezer paper patterns as you did for the corner pieces. Trim the ends to size. Now attach these pieces to the centre of the corner pieces. You can choose to make two or four of these. I chose to make two and place them on opposite corners. 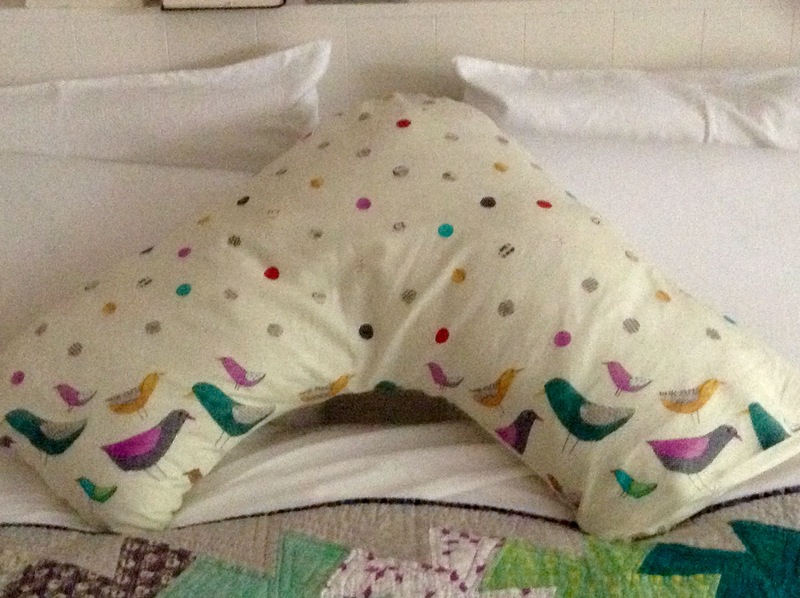 Use a ruler to get the positioning right, iron them down, appliqué and remove the freezer paper..
I’ve just bought a boomerang pillow, sometimes called a tripillow. I like to use it to prop my book on when reading in bed. However, I really, really hate the frilly pillowcases which seem to be the only sort you can buy for them. So I hacked one to pieces and use it as a template and made my own and I’m really happy with the result. What do you reckon? 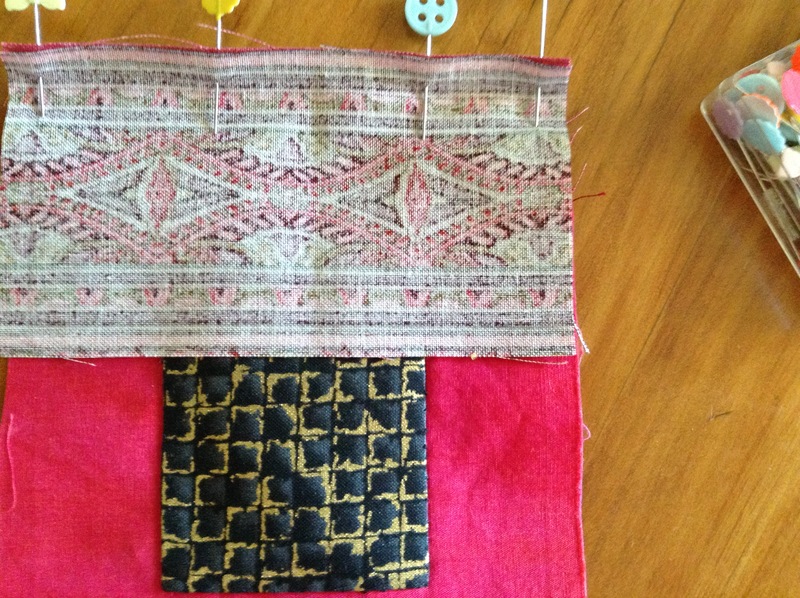 We can now sew the first three blocks together. First take blocks 2 and 3. Fold and pin back the backing and batting from the seam edge. 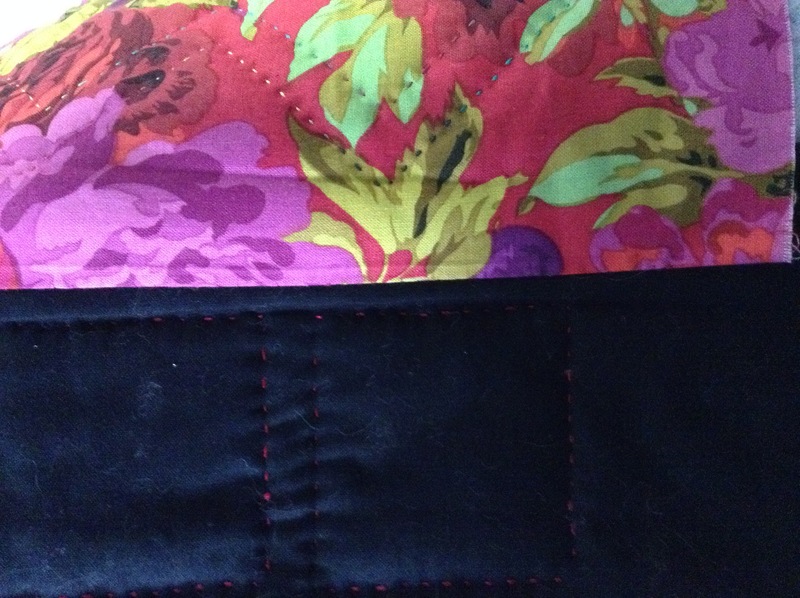 Pin the two sides together and sew a 1/4″ seam. This can be done either by hand or machine. Press the seam – if you used basting spray then use a pressing cloth to prevent the glue burning onto the iron. 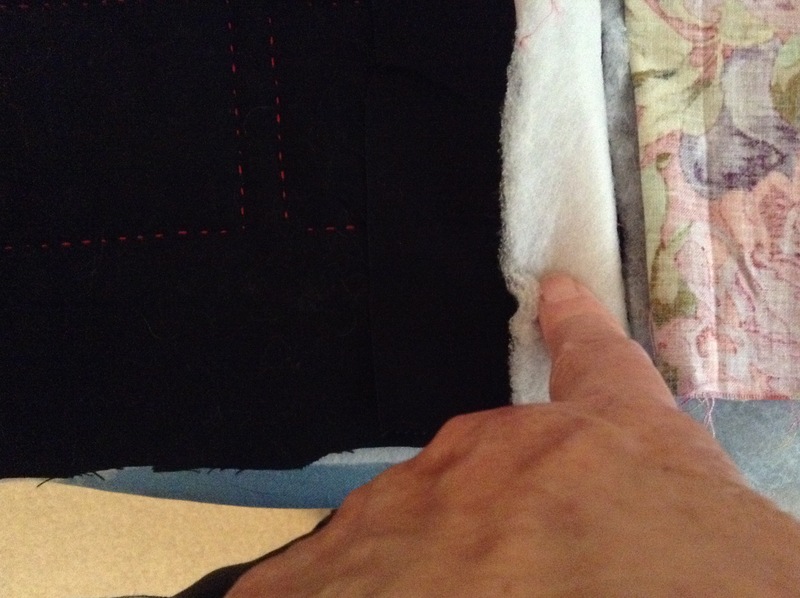 Lay one pice of batting back towards the seam and trim it as close to the folded backing as you can. IMPORTANT: First check that the batting on the other piece will reach all the way across. If it doesn’t then trim so they meet. Then fold the other piece of batting across to meet the first one. If it’s too big then trim it. Fold one of the backing fabrics across to meet the fold of the other backing fabric. 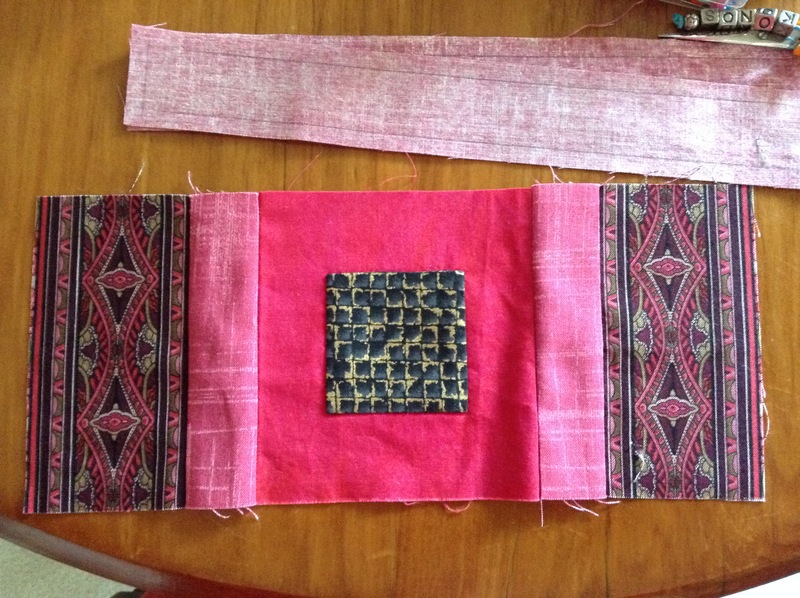 Then fold the other backing fabric across. 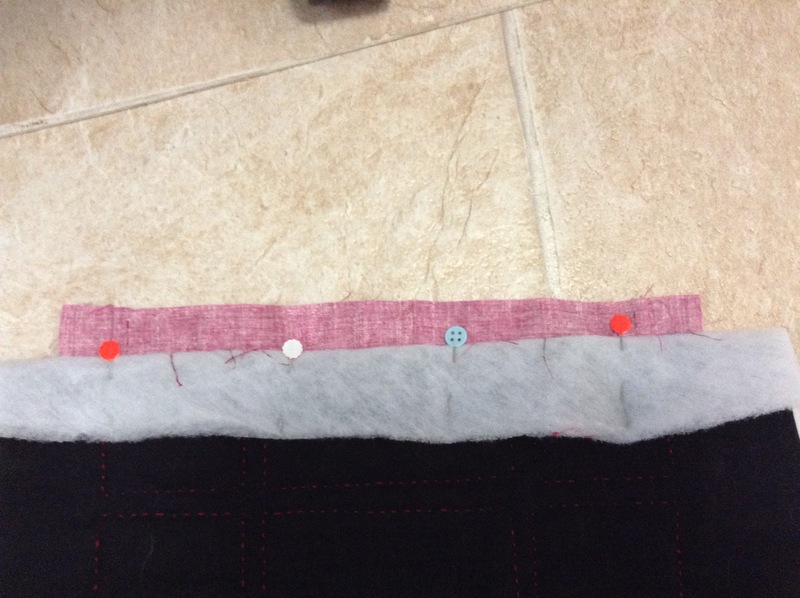 Cut the excess fabric, leaving enough to turn 1/4″ under and then sew the seam down using an applique style stitch. 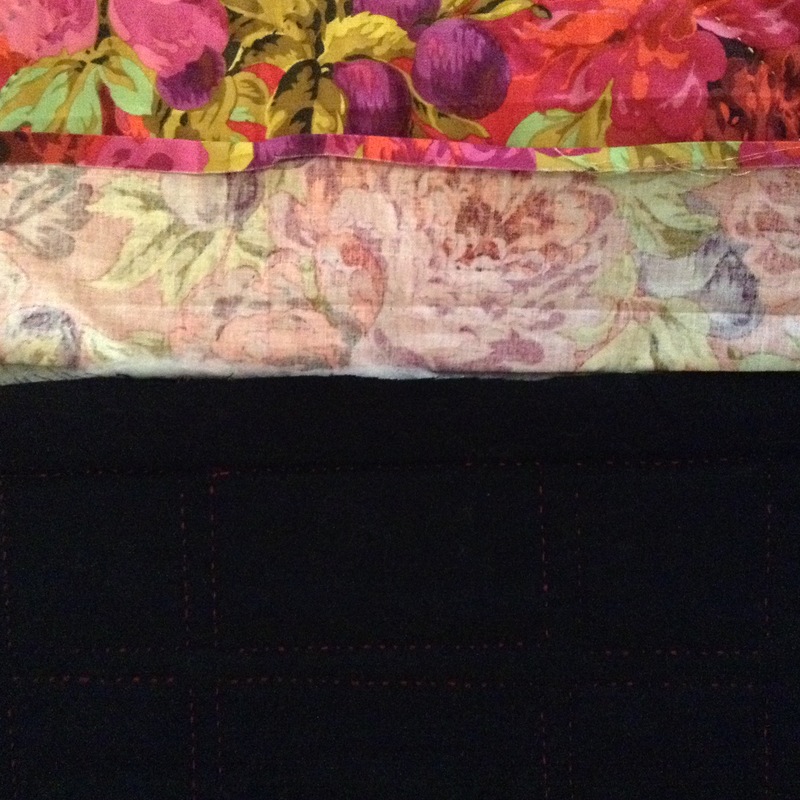 It’s important to note that for the quilt to not “flop around” at the seams, that the front seam, the meeting place of the batting and the back seam are all staggered and not one on top of the other. 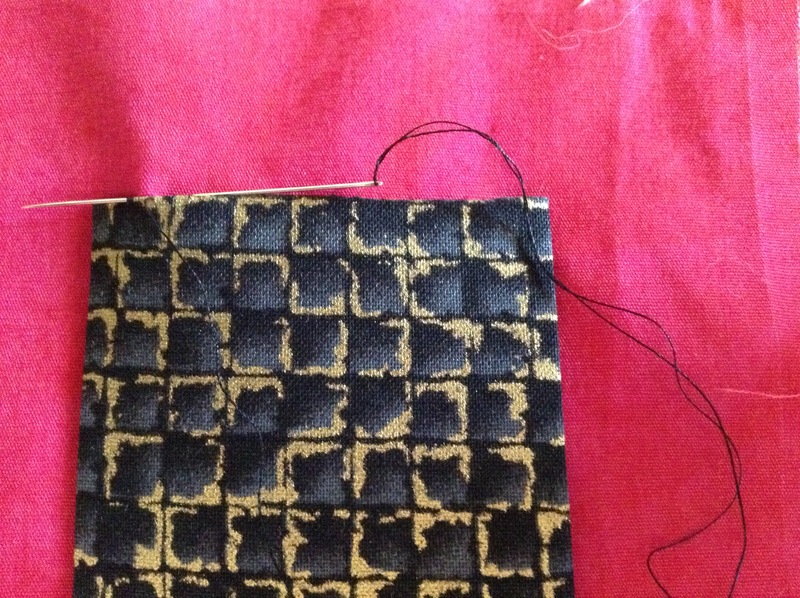 Using the same technique, sew block 1 to the bottom of the other two blocks. This makes up the bottom left hand corner of our quilt. Cut a 2″ square of freezer paper and fold and press the edges of the 2.5″ square of fabric over the edges. (For method see Block 2). 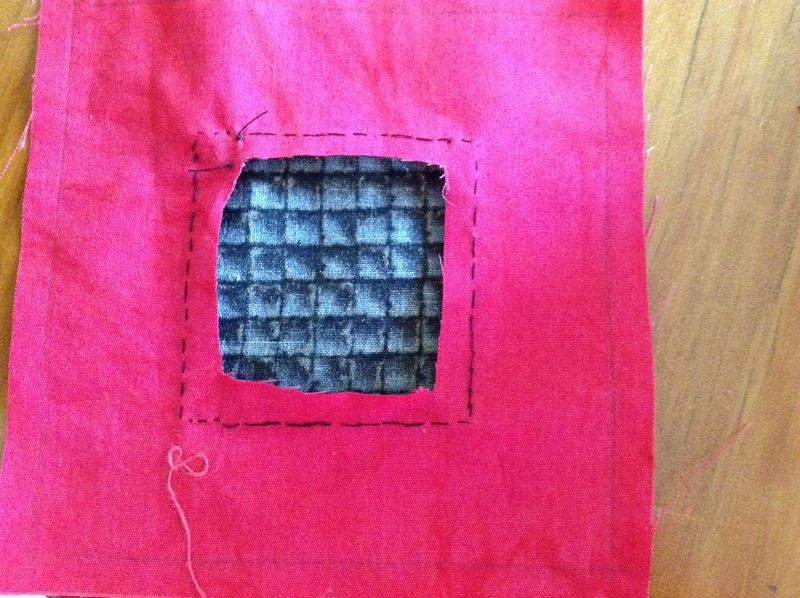 Then press the square to the centre of the 4.5″ square. Applique the centre square down. 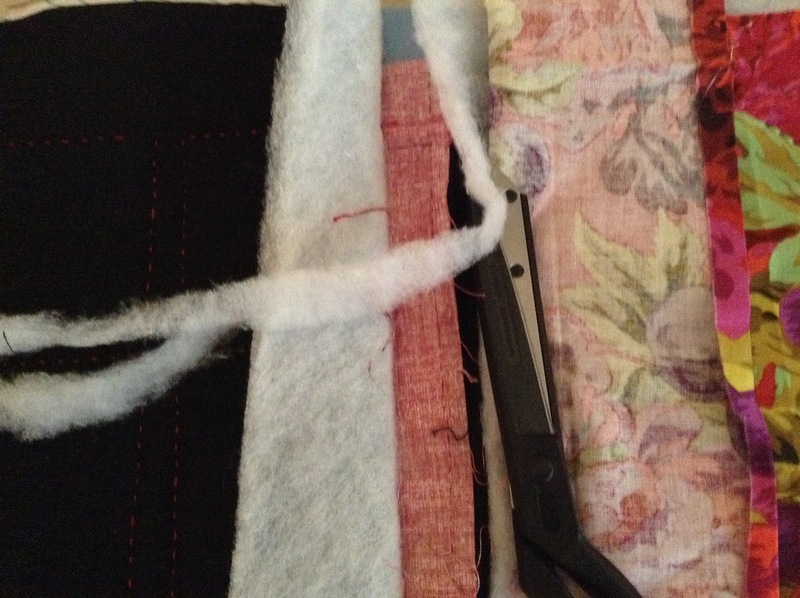 Cut the backing fabric inside the stitching and then pull out the freezer paper and press the block. 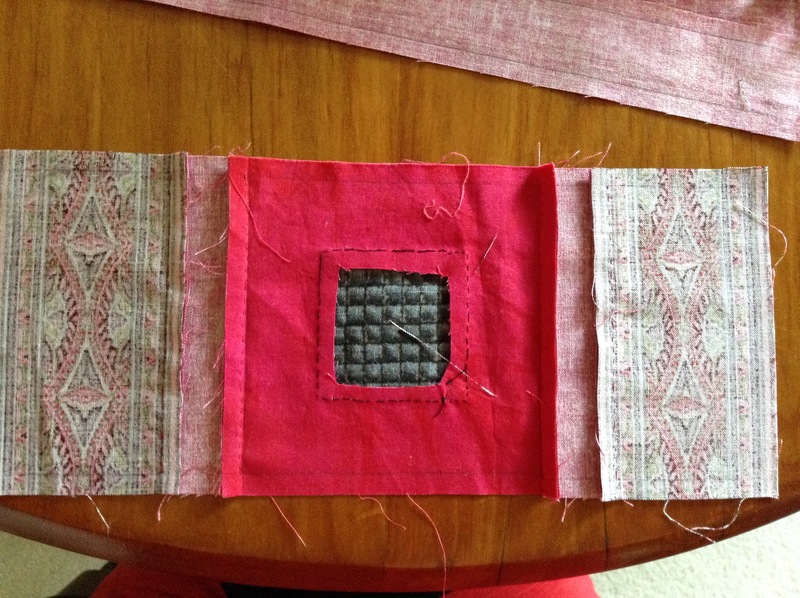 Pin and sew the 1.5″ x 4.5″ strips to opposite sides of the square. 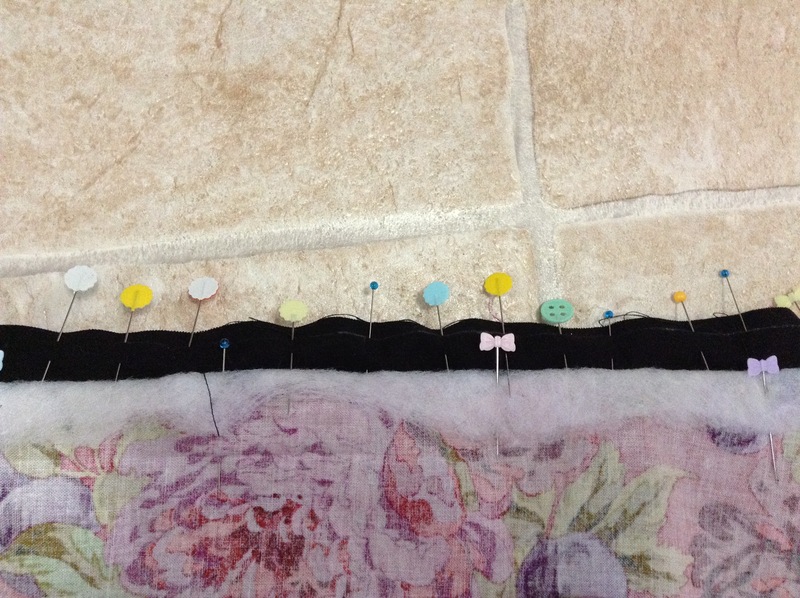 Then pin and sew the 2.5″ x 4.5″ strips to the other side of the strips just sewn. Press the seams towards the centre of the 1.5″ strips as this will make them pop. Pin and sew two of the 1.5″ x 10.5″ strips to the top and bottom of this piece and press the seam towards the thin strip. You have now completed the middle row of the block. For the top and bottom rows, do the following. 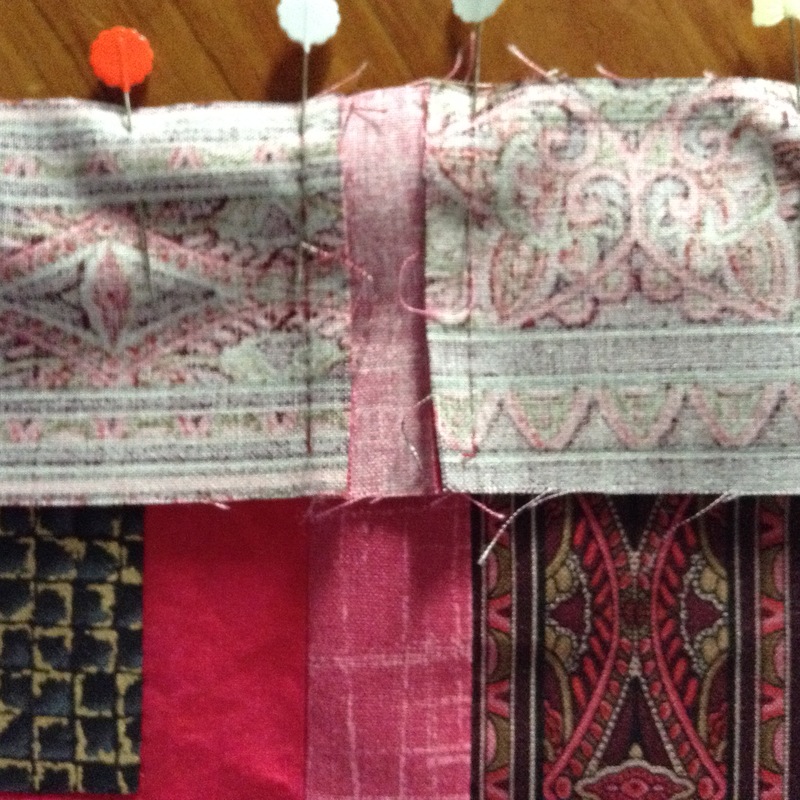 Sew a 1.5″ x 2.5″ strip to one side of a 2.5″ square. 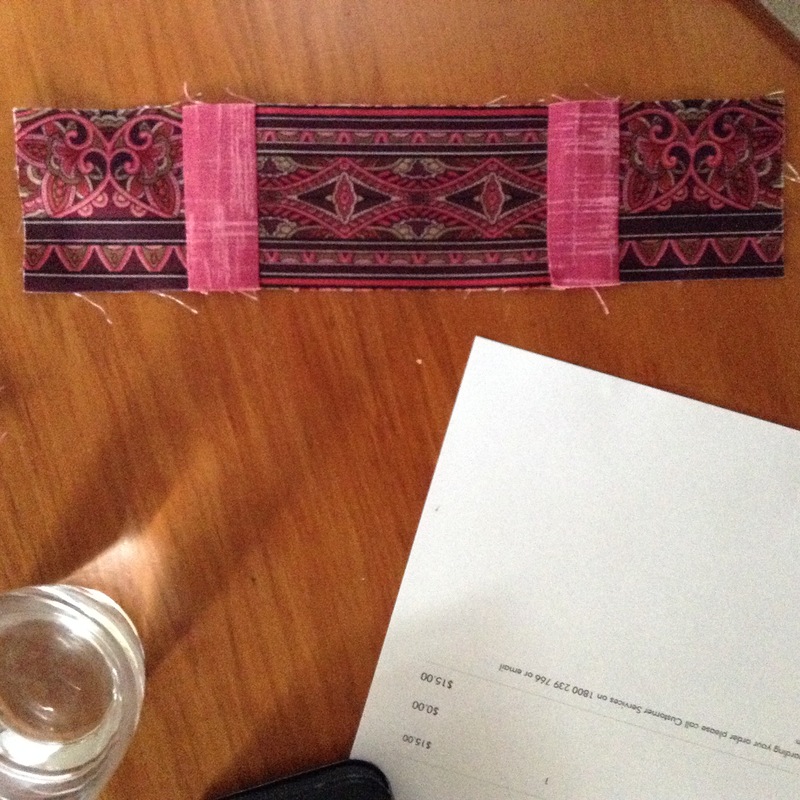 Then sew a 2.5″ x 4.5″ strip to the thin strip. 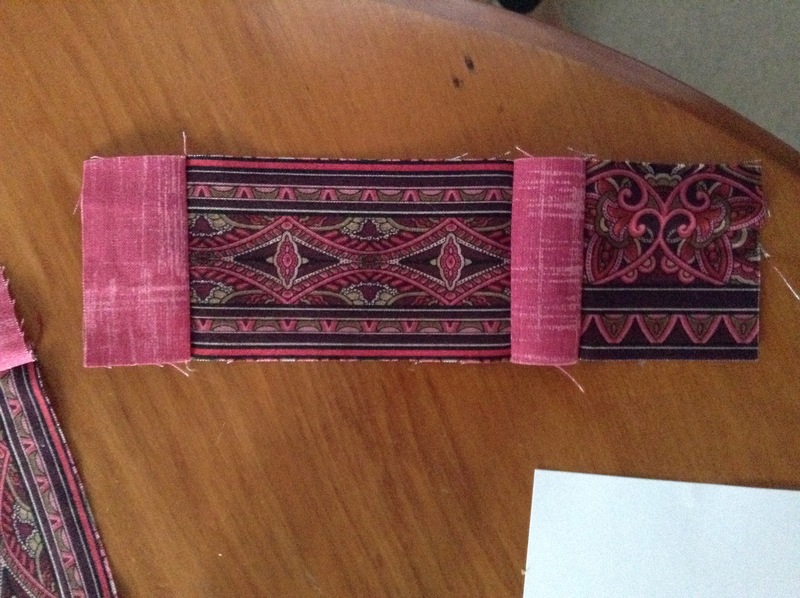 Sew another thin strip to the other side. 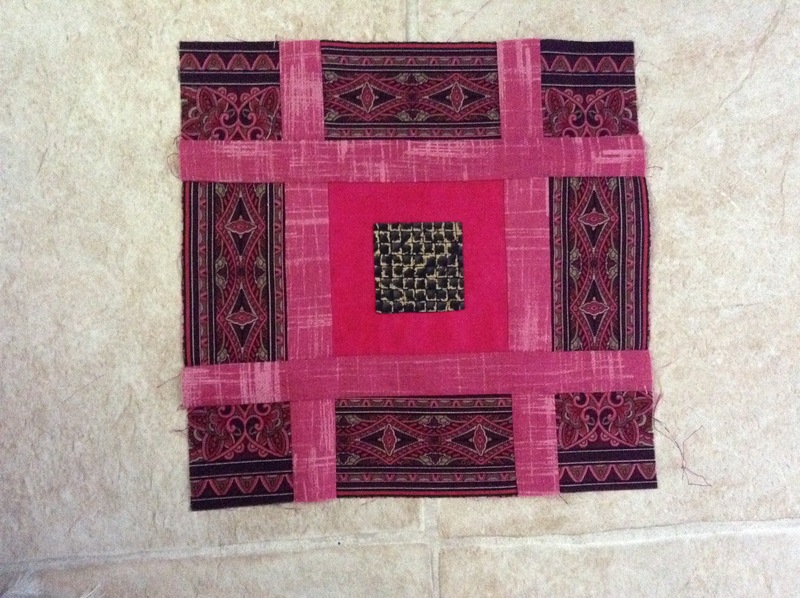 Finally, sew another 2.5″ square to the end. Once again press the seams in towards the narrow strip. 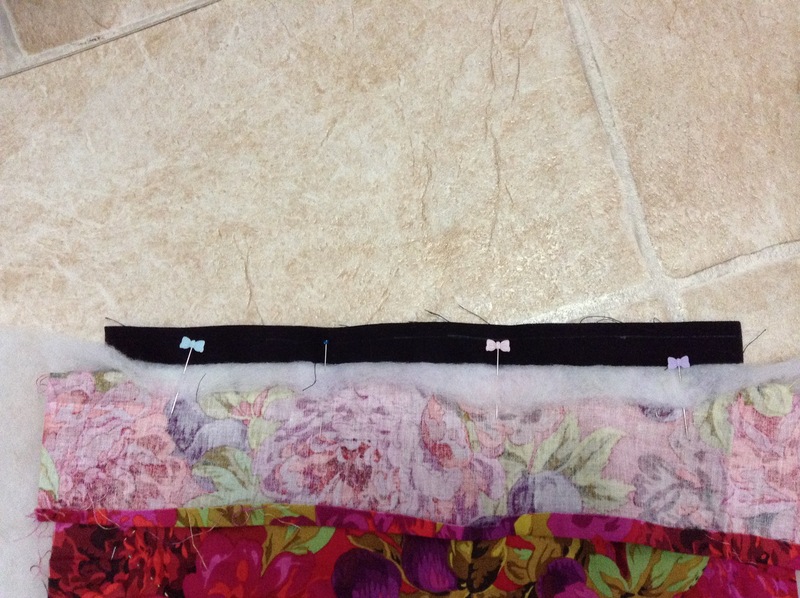 Sew the top and bottom strips onto the middle strip. Sew the last two 1.5″ x 10.5″ strips to either side of the block. Now sew the 1.5″ x 12.5″ strips to the top and bottom of the block. Sandwich the quilt as we did for Block 1. Then quilt as you prefer. 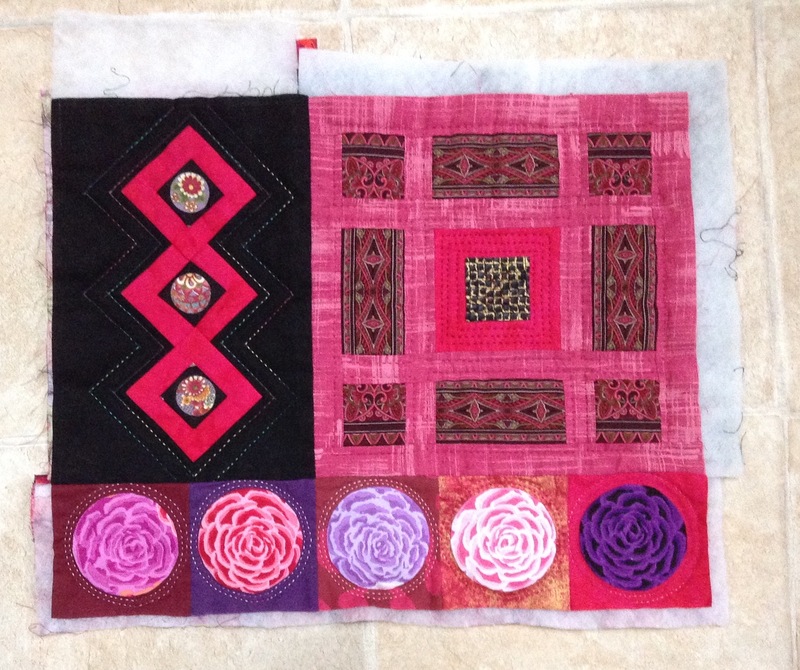 Next time we’ll be sewing the first three blocks together.